Mashup Software app - Create Your Own Songs, Mashups and DJ Sets. Become a mashup maker. Find tracks that sound good together, beatmatch them instantly, and produce your own mashups in as little as 5 minutes. 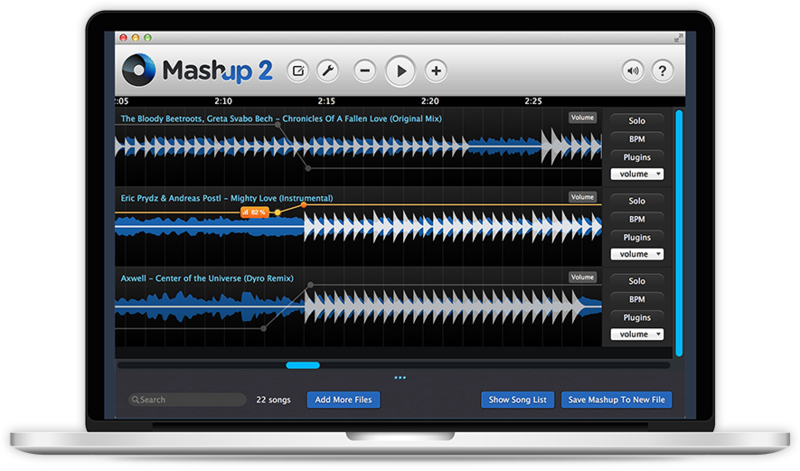 Mashup 2 helps you discover compatible songs and helps you mix them together. How? Using harmonic mixing and other techniques used by top DJs. Your mashups are going to sound professional. Mashups work when tracks are harmonically compatible. If basslines, vocals, or melodies clash, your mashup will suffer. 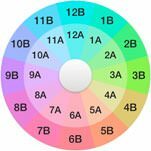 With Mashup 2, harmonic mixing happens instantly. The software analyzes your music and helps you discover tracks that are 100% compatible. Synching tempos of two tracks played at different speeds is called beatmatching. When done properly, two songs sound like one. With Mashup 2, you beatmatch like a pro. Matchup 2 instantly detects the BPM of your first track, and adjusts the tempo of any additional tracks to match.